Q1 How do I become a member? Visit https://shop.gempakstarz.com/login and create an account or click the Facebook Log In button to sign up with your Facebook account. You will become a member of Gempak Starz once your account is created. Membership is free without any hidden charges. Q1 What if I have forgotten my password? Kindly click the “Forgotten password” link on the member login page. You will be required to key in your email address. After that, you will receive an email to reset your password. Please ensure that you check your Spam/Junk Mail folder for the password resetting email. Q1 What are reward points? 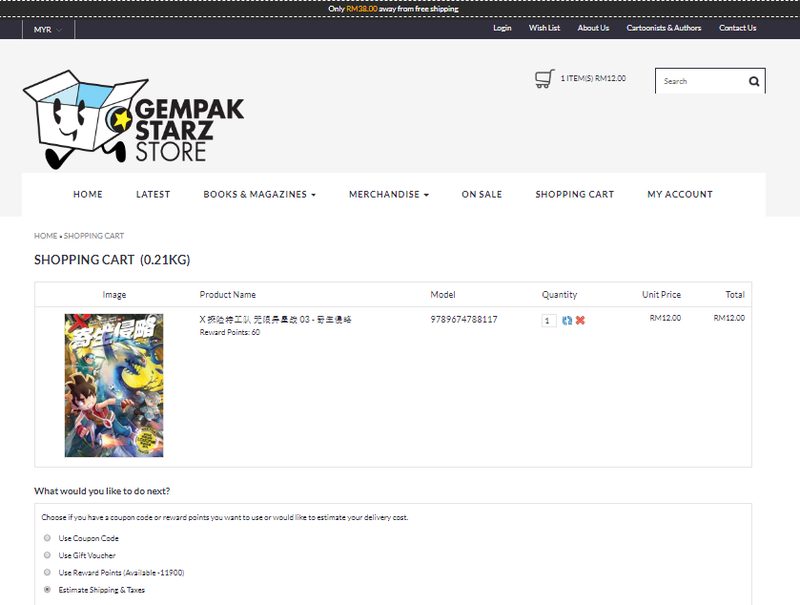 Reward points are rewards given to our members for purchases made at the Gempak Starz online store. These reward points can then be utilised to make purchases or partial redemptions at the Gempak Starz online store. Q2 How can I earn reward points? Q3 How can I redeem my reward points? You must log in to your account and apply your reward points at the checkout page https://shop.gempakstarz.com/cart. Q4 Can I use my reward points at any third party merchandiser? Unfortunately, reward points can only be utilised at the Gempak Starz online store https://shop.gempakstarz.com. Q1 What kinds of payment methods are available at your website? We use ipay 88, MOLPay, and Paypal as our payment gateways; therefore, we accept payment via credit and debit cards, online banking, MOLPay Cash, and more. Q2 Can I place an order through email, Facebook, or a phone call? We are sorry to inform you that we do not accept orders through email, Facebook, or phone calls. Q3 How do I use MOLPay Cash to make a purchase? You may follow the steps listed below to make a payment at any 7-Eleven store. Payment must be made within 48 hours or the order will be expire. We will only proceed with the order once we have received payment. You may also click HERE for more details. Q1 When will I receive my order? We are committed to processing orders as soon as possible after payment has been received. Please allow us 1 to 2 business days to pack your orders and arrange delivery for them. Please note that delivery time may vary during peak periods. Kindly note that our new Singapore online store is now available and that delivery within Singapore is free! Customers in Singapore may visit https://www.sg.gempakstarz.com/ for more details. Q2 How much is the delivery fee? The delivery fee will be displayed on the checkout page. Kindly note that items must be added to the cart in order for the delivery fee to be displayed. FREE DELIVERY is available within Malaysia for purchases above RM 50. Q3 Do you provide international shipping services? Yes, we do provide international shipping. You may view the available shipping destinations on the checkout page. The delivery time for international shipping is stated below. Q4 How can I check the international shipping cost? Step 1: Choose the “Estimate Shipping & Taxes” option on the checkout page. Step 2: Select the destination that you wish to have your order delivered to. Step 3: Get the quote on the shipping fee. Q5 When can I get my order's tracking number after I have made payment? You can expect to receive the tracking number within 2 business days after payment has been made. Q6 How do I track and trace my order? Step 2: Key in the tracking number, eg: xxxxxxxxxxx, and search. Q7 I can't track my order on the courier's tracking page. What should I do? If you are unable to track your order on the courier's tracking page, your parcel might have been just handed over to our courier partner. Kindly note that tracking numbers take up to 24 hours to become activated on the courier's tracking system. In the event that you are still unable to track your order 24 hours after receiving the tracking number, please contact our Customer Care team via our Facebook live chat box on our official Gempak Starz website (excluding weekends and public holidays). Q8 What happens if I do not receive my order after the standard delivery period? In the rare occurrence that your order is not delivered on time, please contact our Customer Care team via our Facebook live chat box on our official Gempak Starz website, and we will be happy to assist you. Q9 Do you deliver during weekends and holidays? Unfortunately, our courier partners are unable to deliver during weekends or public holidays. Please expect to receive your orders on business days only. Q1 Can I cancel my order if I already made the payment? Products sold are non-refundable; therefore, we regret to inform you that orders cannot be cancelled once payment is received. Kindly ensure that you have checked and validated all details and information before you proceed with payment. Q2 There is something wrong with my product. Can I get an exchange? Kindly provide our Customer Care team with the original receipt and evidence of the defect. Products with the defects listed above are eligible for an exchange with another product of the same value. If your product's defect is not one of those stated above, contact us via our Facebook live chat box on our official Gempak Starz website. Kadokawa Gempak Starz Sdn Bhd will review defects on a case-by-case basis and reserves the right to determine a product's eligibility for exchange. Q3 If I have purchased items from another online marketplace or physical store, can I still exchange them at the Gempak Starz online store? Unfortunately, all products purchased through third party merchandisers cannot be returned or exchanged with Kadokawa Gempak Starz Sdn Bhd. Conversely, all items purchased through the official Gempak Starz website (https://shop.gempakstarz.com/) may be exchanged by contacting our Customer Care team. Q4 Can I exchange items after 20 days have passed from the tax invoice date? Unfortunately, products cannot be exchanged after 20 calendar days from the tax invoice date. Q1 If I have questions that are not covered here, where can I direct my enquiries to? You may contact us via our Facebook live chat box on our official Gempak Starz website.